An architect’s rendering depicted what GE’s 12-story tower would have looked like along the Fort Point Channel. Maybe they’ll start calling the place Kendall-by-the-Sea. General Electric’s brokers at CBRE began circulating an offering memorandum this week to pitch GE’s future headquarters site to potential buyers. 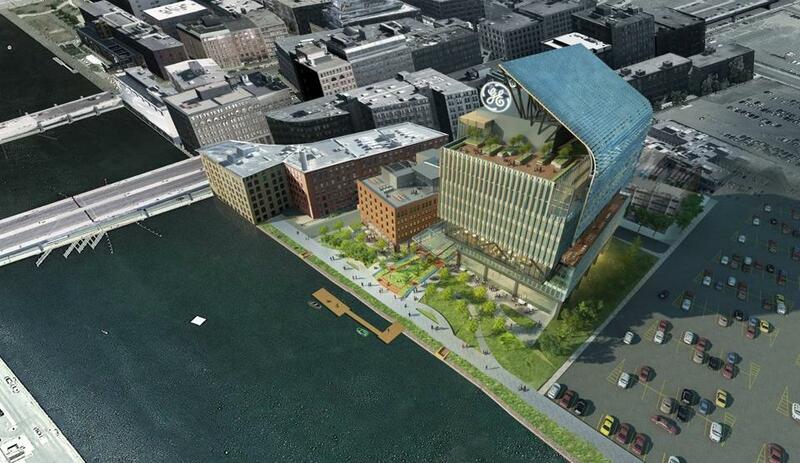 The document’s only big surprise isn’t really a surprise at all for Boston’s commercial real estate gurus: The 12-story office tower that GE once wanted to build along the Fort Point Channel is being marketed as lab space. Yes, CBRE is also pitching the tower to would-be office tenants or developers. But the real estate firm’s memo makes an argument for a life sciences option, explaining that the ceiling heights would provide the necessary space for lab infrastructure. No return trip through Boston Planning & Development Agency rigmarole would be required. The brochure promotes the Boston-Cambridge market as the “No. 1 life sciences cluster” in the US: We’re tops for National Institutes of Health funding and attracting new life sciences talent, and second-best in terms of total life sciences employees (behind San Francisco) and growth rate (behind Seattle). The local office market is hot, too. But not like this. Kendall Square’s lab vacancy rate is essentially zero. As soon as a broom closet hits the market on Binney Street, some eager biotech calls dibs. The inevitable spillover is following the Red Line — a.k.a. the Brain Train — northwest to Alewife and southeast to the Seaport. GE, of course, made a big splash in 2016 by moving here with plans to renovate and combine two old brick buildings (to be called 5 Necco St.) and build the flashy office tower (15 Necco St.). But the company has since pared back its ambitions and its business lines, to raise badly needed capital. The twin Necco buildings will suffice now. No need for that tower anymore. GE wants to relocate from temporary digs nearby in August. GE said last month that it would sell the entire 2.7-acre site — a package labeled “Innovation Point” that includes the two brick buildings and the permits for the 293,000-square-foot tower. The first goal is to clear $87 million, to reimburse the state for its investment in the property. Each dollar over that amount would pay back GE for its renovation expenses, until it is fully reimbursed. The company and the state would split any remaining proceeds. A buyer could opt to try something different on the acre where the tower would go. But that would mean a year-long slog through meetings and negotiations at City Hall. The CBRE pitch instead plays up the “shovel ready” nature of the tower plan for 15 Necco. Another plus: the promise of at least 10 years of rent, starting at nearly $4.2 million a year, from GE for 5 Necco. The 12-story tower, a stone’s toss from South Station, could be ideal for another headquarters office — presumably for a corporate tenant in better financial health than GE. But the lab proposal offers a compelling alternative. Look at all the VC money coursing through the industry. In a recent market overview, brokerage Hunneman notes that Boston-area biotechs raised $4.3 billion in 2018, roughly equaling what the sector raised in the previous two years combined. IPO funds, meanwhile, more than doubled in 2018 from the year before. Office-to-lab conversions are taking shape in the suburbs — as well as in Boston buildings like 451 D St., not far from GE in the Seaport. Vertex Pharmaceuticals was early to the party when it opened new corporate offices and labs on the South Boston waterfront five years ago. Alexion Pharmaceuticals pulled a GE and moved its HQ offices there from Connecticut last year. Two separate projects that could draw more life science companies are planned for either side of West Second Street, closer to the Broadway T stop. Everyone likes to speculate about the next Kendall Square. Where will it be? Watertown? Allston? Waltham? With its GE pitch, CBRE makes the case that the answer can be found just across the Channel.